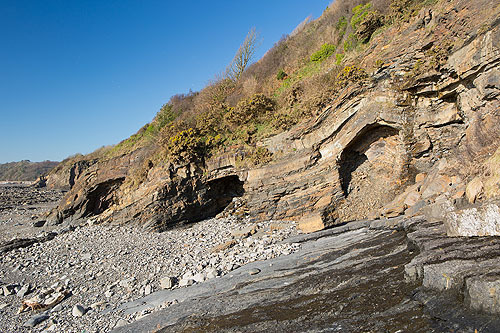 Dramatic folding in the rock strata of the " Coal Measures " Cliffs - "Crickdam Patch" - near Amroth. The "Crickdam Patch" was the most important of four iron ore mining "patches" on the coast between Wiseman's Bridge and Amroth. At Crickdam, there was a mineyard, workshops and store houses . Some limewashed stones from the blacksmiths shop remain , perched on a ledge just behind where this photo was taken. By 1848 a tunnel had been cut through the cliffs from the Crickdam Mine site to the Saundersfoot Railway and drams from Crickdam were discharged into the trams of the Saundersfoot Railway. The tunnel , covered by a rock fall is in the cave on the right. A similar photo , just about showing the Tunnel , is in the late Roscoe Howells book 'Old Saundersfoot' . Another tunnel existed at "Bridge" Patch , the main patch near Wiseman's Bridge.